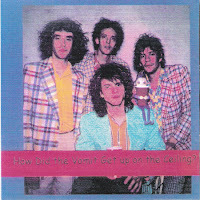 Wilfully Obscure: The Replacements - How Did the Vomit Get Up on the Ceiling? The Replacements - How Did the Vomit Get Up on the Ceiling? Since my last Mats upload (Boink!!) was such a roaring success, I've decided to follow it up with this 26 track collection, predominately consisting of demos and outtakes for the Tim and Pleased To Meet Me albums, although there are a few b-sides from subsequent albums included as well. Sorry for the lame sleeve. Wasn't my design. Enjoy. By next weekend I will/may/possibly resume posting on a more consistent basis. Cheers. Yeah, this Replacements stuff you're posting is really, really cool. I've had a lot of these tracks, but not all of them. Thanks for taking the time. Great stuff. Thanks! Ditto for the retooled Boink. Its funny that 23 years on I'd still be as much into these guys as I was back then. By the way, here are some high resolution cover scans courtesy of the great site Color Me Impressed. Any Replacement live shows you can post? I'm looking for the show w/ Alex Chilton from '85 or '86. Anyone know what year this was put out? I think this came out in 1996 or 1997, from memory. can you re-post this please?